AzhwAr says in this pAsuram that emperumAn, leaving the comfort of the mattress that AdhiSEshan provides (as part of all the services that he willingly carries out to emperumAn), comes down to the materialistic realm and protects it. His nature is such that in order to make the people of this realm also to be his servitors and get them to carry out services like AdhiSEshan does, he sets aside his greatness and comes to lower levels. As per thamizh grammar, this poem falls under the category of niral nirai aNi in which each of the terms in the first part of the poem corresponds to each of the terms in the second part in the same order that the terms appear. An mEyththu – though he is emperumAn, he did not consider his greatness but came down as a cowherd boy and took the cattle for grazing. kurundham osiththu – when a demon entered a tree kurundham in order to kill krishNa, krishNa uprooted the tree, killing the demon. puL vAy kINdu – kamsan asked his friend bakAsuran, a demon, to take the form of a bird [crane] to kill krishNa. But, krishNa, knowing the disguise of the demon, killed the bird by tearing its beak. 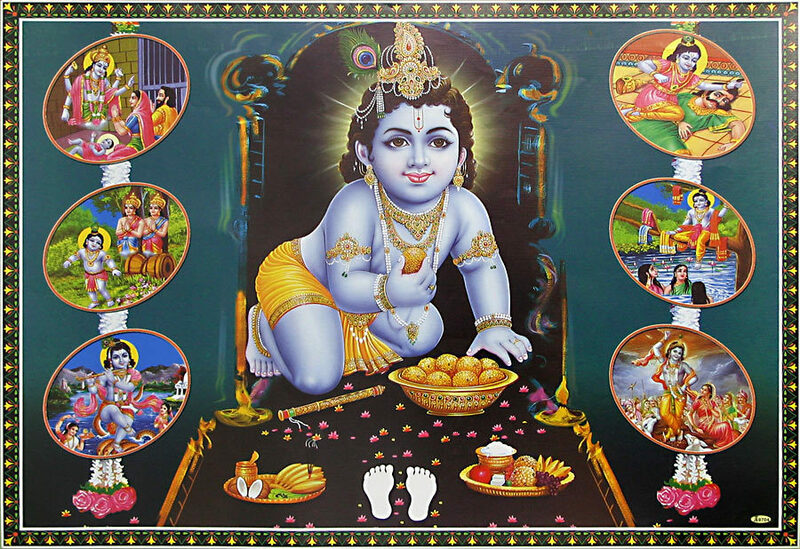 mulai uNdu – kamsan first set off pUthana, his friend, to kill infant krishNa. She took the form of yaSOdhA, krishNa’s mother and offered her poisoned milk to him, and he drank both her milk and her life, thus killing her. mal attu – kamsan, after kuvalayApIdam was killed, set off his champion wrestlers against krishNa. But both chANura and mushtika, the wrestlers, were killed by krishNa in the wrestling match. kunRam eduththu – indhra, the deity of celestial persons, was denied food by the people of gOkulam. In anger, he rained hailstorm on gOkulam. krishNa lifted gOvardhanam, a hill around gOkulam and saved the herds-people. karavinRi vittu – emperumAn did not hide anything while engaging in the above mentioned acts. There are two meanings given for karavinRi – allowing someone to escape without killing him, and acting honestly without anything deceitful. emperumAn takes all these efforts after leaving the comfortable mattress of thiruvanthAzhwAn (AdhiSEshan) and his services. In irandAm thiruvandhAdhi 15, bhUthaththAzhwAr says “nAgaththaith thaN paLLi koLvAn thanakku” (emerpumAn has AdhiSEshan as his comfortable bed). Let us take the 55th pAsuram next. This entry was posted in iyaRpA, mudhal thiruvandhAdhi on August 3, 2017 by T N Krishnan.